Business style. The business laptops of Dell's Latitude lineup are actually made for entrepreneurs. 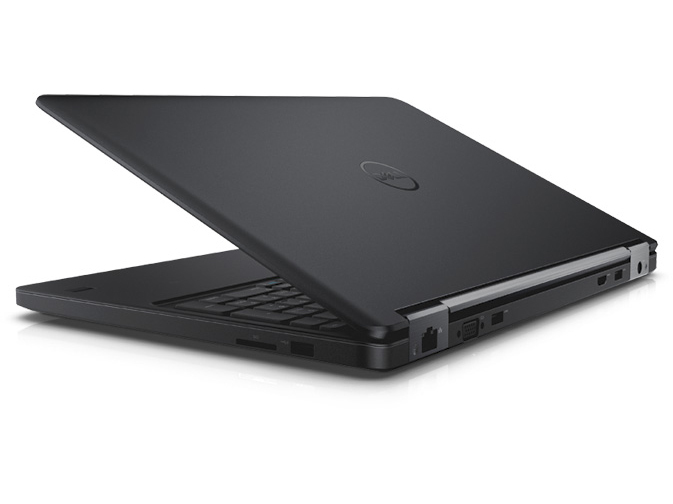 However, the slim Dell Latitude E5550 and its plastic casing also fit medium budgets. Our report clarifies whether the E5550 is just another office machine, or if it might just add a touch of elegance to the desk. Productivity is the primary aspect in many offices. The device is nevertheless to radiate a certain degree of exclusiveness on the desk or when meeting business associates. For this reason, Dell offers different lines of its 15.6-inch Latitude laptops. 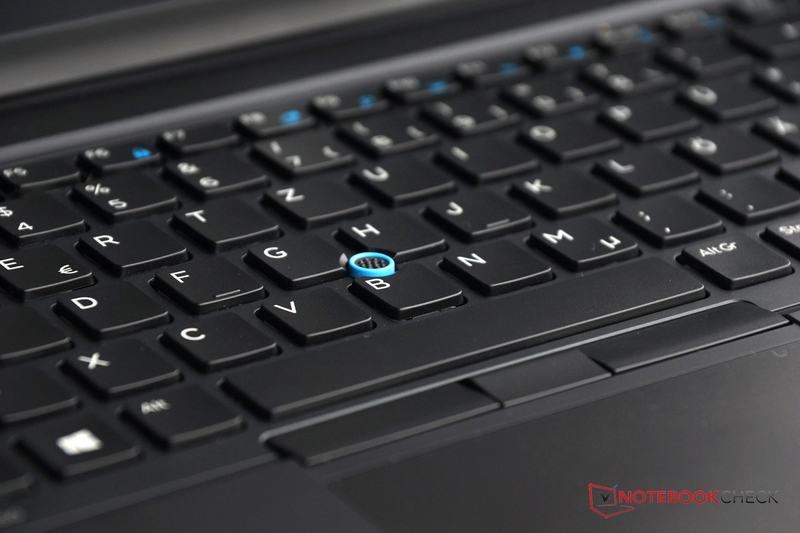 There are the stylish ultrabooks from the 7000 series, particularly high-performance machines in the 6 series, plain and low-cost entry laptops in the 3000 series, and the 5000 series with a restrained appearance and sufficient power for medium-sized budgets. 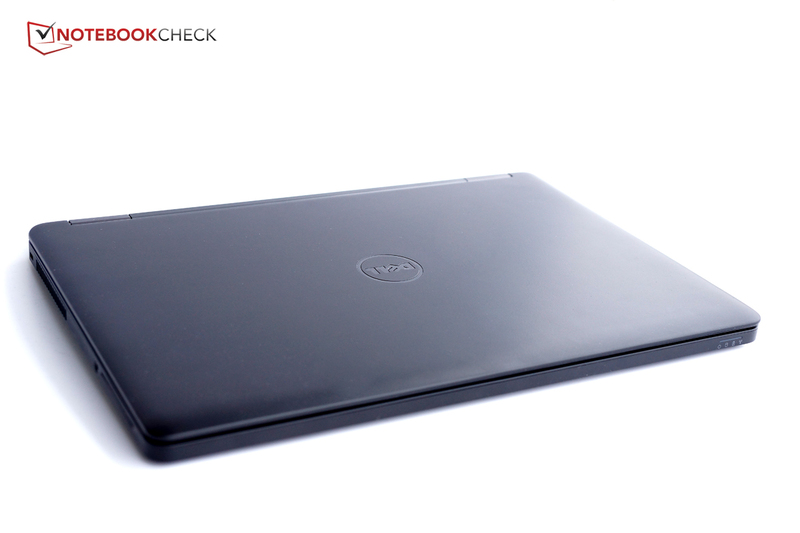 We are testing the new 15.6-inch model from the 5000 series, the Dell Latitude E5550. We quite liked the precursor, Latitude E5540, but a more stable casing, and a better screen could have been installed. The Latitude E5550 has a new design and new IPS screens. We will examine whether this is a step forward or a step back. There are many devices in the Latitude E5550's price range that vie for businesses that often purchase hundreds of devices for their employees. 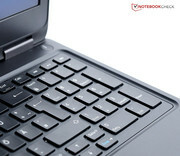 The AsusPro P56CB-XO193G, Acer TravelMate P455, Lenovo ThinkPad L540 or HP ProBook 655 represent possible alternatives. Although we tested Dell's Latitude E5540 only seven months ago, the casing of its successor, Latitude E5550 has changed a lot. First, the DVD drive has been axed, which allows reducing the casing's height by six millimeters (~0.24 inches). This alone gives the Latitude E5550 streamlined and more modern looks. The device has also lost weight. It now only weighs 2.14 kilograms (~4.7 lb), which is 260 grams (~9.2 ounces) lighter than before. However, the fundamental design language has not been changed: rounded corners, prominent double hinges, and restrained black. The dedicated keys for volume control have been omitted, and the keyboard moves up closer to the display. In addition, there is a revamped power button, and new status LEDs on the front. The keyboard has also been redesigned. It is now more basic, and the rounded corners also look more compelling. Plastic is still the dominating material - the Latitude 7000 series provides metal casings. The surfaces still have a high-quality feel, and the lid features a non-slip, soft-touch coating. The stability has improved; the lid can hardly be warped now, and pressure is no longer passed on to the screen. The marginally uneven gaps above the fan are acceptable, particularly since the casing makes a significantly more consistent and considerably higher quality impression than its precursor. In addition, the lighter weight and lower height contribute to the mobility factor. 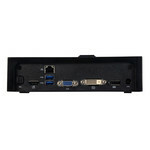 Dell bids farewell for good to the slow USB 2.0 ports with its Latitude E5550, and now only USB 3.0 is available. However, the number of ports has been reduced from four to three. 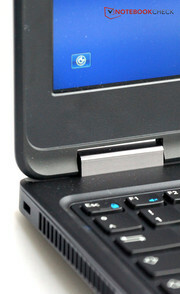 The ExpressCard slot and physical Wi-Fi button have also been axed, and an external DVD drive has to be used. The monitor interfaces are now located on the rear (VGA and HDMI), where they are unlikely to interfere. 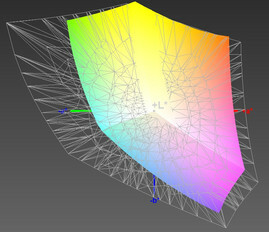 The interfaces on the sides are also located in the rear area so that they will not collide with the mouse hand. Right-handed users have a slight advantage because the headphone or headset jack is in the front area. Dell has done some saving at this point, and only installs a combined jack for use with, for example, a smartphone headset. Users who want to connect high-quality headsets with dedicated plugs, will be left empty handed. A docking port with the same connector as the precursor is on the underside. 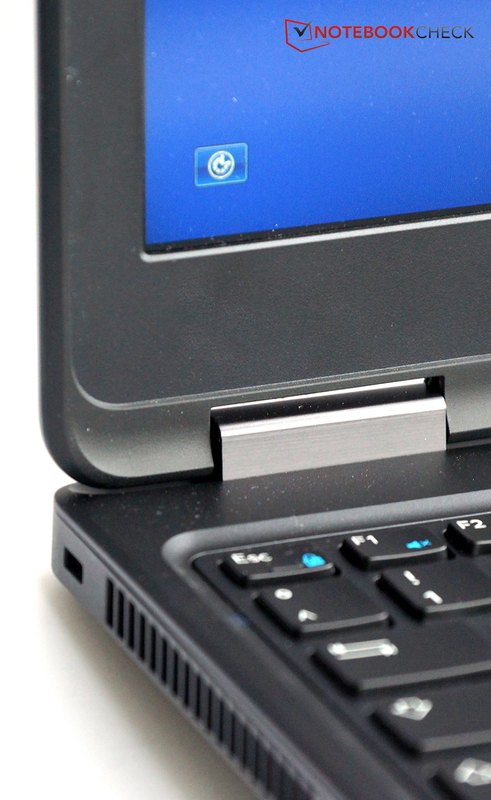 Consequently, the Latitude E5550 should be compatible with existing docking stations that fit the Latitude series. The company network can be accessed via a Gigabit LAN card and the LAN port on the device's back with up to 1000 Mbit per second. Wireless communication is possible via a Wi-Fi module with two antennas for a higher transmission and reception performance, dual-band support for the 2.4 GHz and 5 GHz frequencies, and networks that operate in the 802.11 ac/a/b/g/n standards. This covers the latest Wi-Fi standards. Bluetooth 4.0 LE is also available, but not NFC. However, the SmartCard reader has an NFC module that checks contactless smart cards. For security reasons, this module cannot be used for other purposes. The Wi-Fi module's transmission power is comparatively strong, and enabled 4/5 of the signal even ten meters (~33 ft) away from the router, and through three walls. Two more meters (~6.5 ft), and another wall, resulted in 3/5. The speed dropped noticeably beyond that. The buyer can also opt for a Qualcomm Gobi wireless card that enables mobile Internet in the LTE standard. The price of 60 Euros (~$74) is reasonable. This module was installed in our review sample. However the device has to be opened (screws) to insert a SIM. Inserting the micro-SIM proved quite impractical and awkward. Unfortunately, we could not set up an LTE connection in the poorly developed German E-Plus network. On the other hand, the UMTS signal was decent, and even allowed transmitting data with adequate speed. Dell uses both software and hardware solutions, such as a fingerprint reader or the SmartCard module, for security matters. The latter two are optional, but were integrated in our review sample, and depending on the model, are available for a fairly low extra cost. The optional fingerprint reader is also available in compliance with the FIPS standard of the American government. We could not test the SmartCard reader for the lack of a smart card. 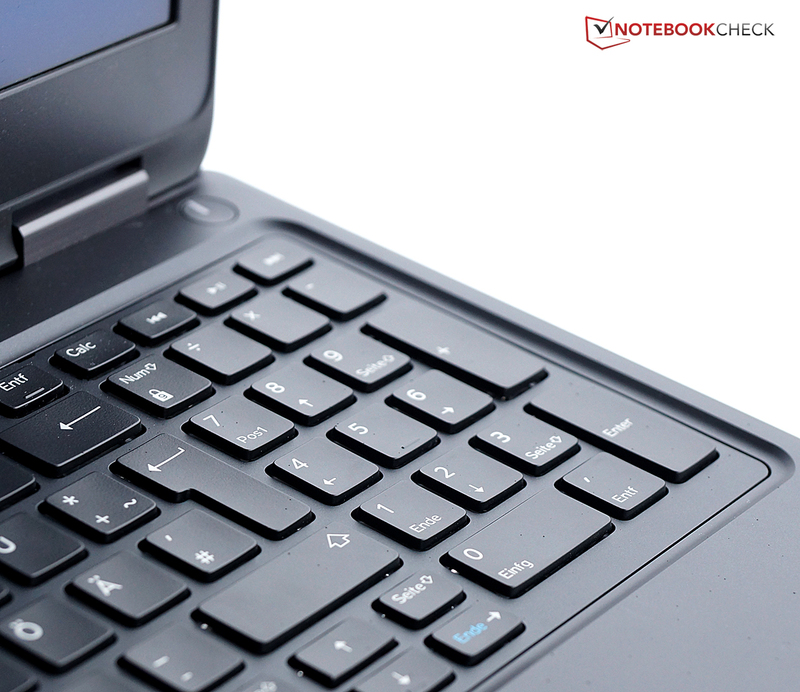 However, the fingerprint reader functioned reliably for unlocking the laptop. 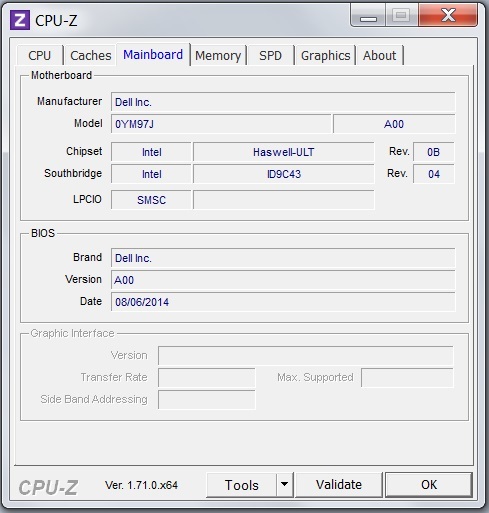 Intel's vPro technologies are also generally incorporated for more security behind the operating system. In addition, Dell offers its DDP | E (Dell Data Protection | Encryption) security package that enables encrypting all business data, no matter whether on the hard drive in the laptop or a cellphone. Of course, cloud storage or an external storage device can also be encrypted. Depending on the size of the business, the features can be controlled either from the laptop, or centrally. This requires a subscription that costs up to 45 Euros (~$56) device/year depending on the selected features. "Dell Protected Workspace" can be started from the desktop. It enables editing data and documents under special protection against malware. Since the device now lacks an optical drive, Dell has simply included an 8 GB USB flash drive with the system image. The images of Windows 7 Professional and Windows 8.1 Pro are both on the flash drive included with our review sample, and either one can be installed. The most interesting accessory for the Latitude E5550 are the port replicators that will probably be found in every workplace. On the one hand, not every single cable has to be unplugged when moving the laptop, and on the other, it clearly enhances the diversity of interfaces. Dell has two versions of the compatible e-port replicators: "simple" and "advanced". The simple version adds a few more USB 3.0 ports, eSATA, a display port, DVI, and VGA, as well as a separate headphone/microphone jack. The advanced version features very old interfaces, such as a parallel port or PS/2 port, as well. The simple version costs 180 Euros (~$223), and 210 Euros (~$260) due to the advanced version, both plus VAT. Only six screws have to be removed to access many components. 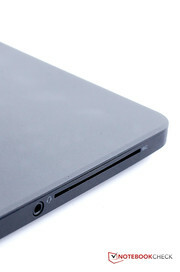 One disadvantage of the lower height is that the battery can no longer be removed from the outside. Instead, the base plate of Dell's Latitude has to be removed every time the user wants to access the components. Fortunately, this is quite simple to do. Six screws have to be removed and the large plastic cover can be easily lifted off. Two additional screws secure the battery, and a cable has to be disconnected before removing and replacing it. The Wi-Fi and WWAN module, hard drive, working memory and cooler are also quick to access. 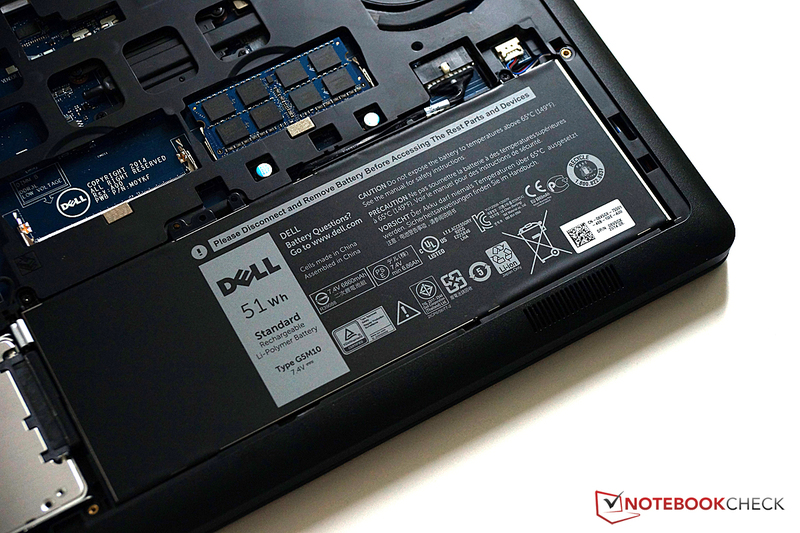 Overall, the Latitude E5550 is still maintenance friendly, even if the battery is no longer so easy to remove. 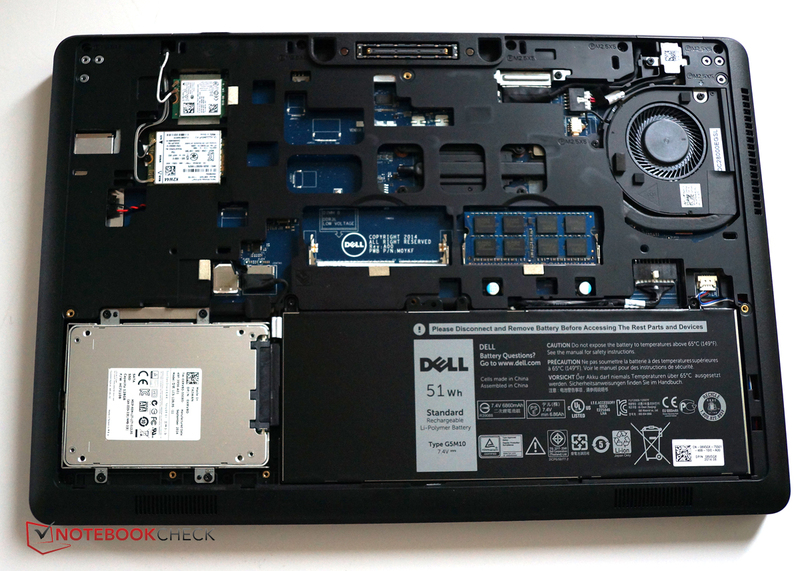 Exemplary: Dell provides detailed instructions for disassembling the laptop's components on the Web. A 12-month base warranty is included in the purchase price. Dell offers several options for longer protection periods. Users who do not want to send in their laptop, and prefer having a technician on site, can add a one-year on-site service for just under 45 Euros (~$56). This can be extended up to five years for a maximum of 96 Euros (~$119). Two years of Pro Support for 24/7 service costs 96 Euros (~$119). This can also be extended up to five years for a maximum of 235 Euros(~$290). The keyboard has also been significantly revamped. The simpler design with rounded corners and slightly concave keys appealed to us more than that of its precursor. We immediately noticed that the keys have a very agreeable pressure point. It is neither too soft, as the keys' pressure provide good feedback, nor is it too hard, resulting in a very pleasant typing experience. The layout, with a full-size number pad and a few function keys largely corresponds to the keyboard in its precursor. However, the "Pos1" key is now the "Print" key, and the "End" key has been removed completely. Therefore, there is more room for the "F1"-"F12" keys, and hardly anyone will really miss these rarely used keys. The size of the keys has not been changed. The standard keys have a size of 15 square millimeters (~0.6 inches), the enter key is still slightly small, but the layout is logical and even touch typists will cope well right away. Since the keyboard has moved upward, there was also room for a larger touchpad. The one in the precursor had a diameter of 9 centimeters (~3.5 inches), which has now increased to 11 centimeters (~4.3 inches). 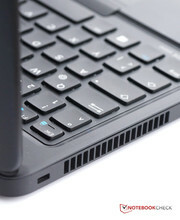 Otherwise, the touchpad has fortunately adopted many of the good properties of the one in the Latitude-E5540. The surface is pleasantly sleek and accurate in use. At the same time, the two dedicated keys below it provide a clear feedback and have a good pressure point. A TrackPoint with dedicated mouse keys below the keyboard is found between the "G", "H" and "B" keys. Anyone who has ever chased the mouse over the screen with the small joystick will know why so many users love this input method. It is highly accurate and its use is even more intuitive than a touchpad. Besides that, the hands do not have to leave the keyboard. 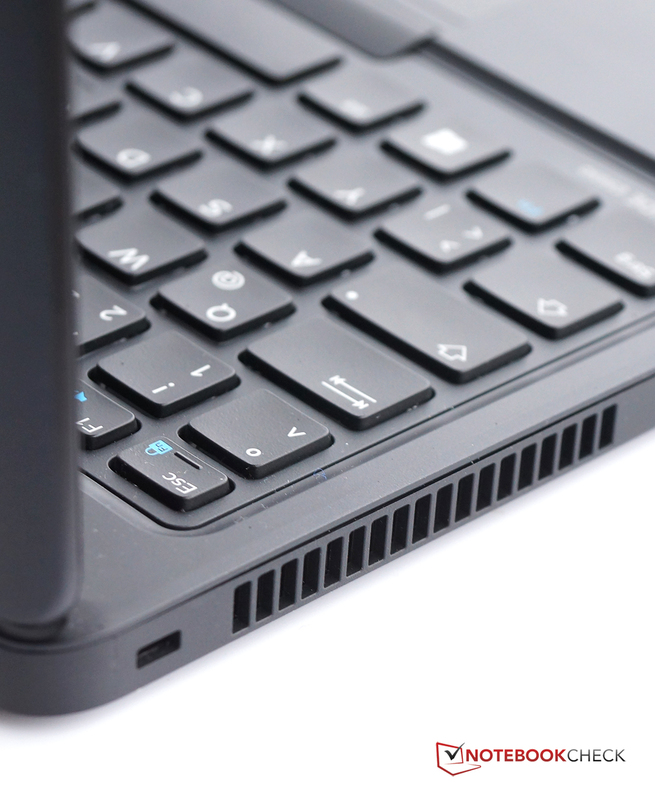 The TrackPoint in Dell's Latitude E5550 also impresses with accuracy and pleasant use. We were not really happy with the screen in the precursor, Latitude E5540. The TN LED technology limited the viewing angles, and both the brightness and contrast were only mediocre. In addition, the color accuracy was very imprecise. Dell has listened to this criticism, and has now installed an IPS screen with a resolution of 1920x1080 pixels and matte finish. A touchscreen is also available. The screen in our review sample is non-touch, and comes from Samsung. It has a comparatively high maximum brightness of 343 cd/m², and has a relatively homogeneous illumination of 88%. The black level of 0.36 cd/m² is now also much better than that of its precursor, where we measured 0.59 cd/m². This, in conjunction with the higher brightness, leads to a considerably improved contrast of 953:1. The color reproduction is also clearly better than it was in the Latitude E5540. 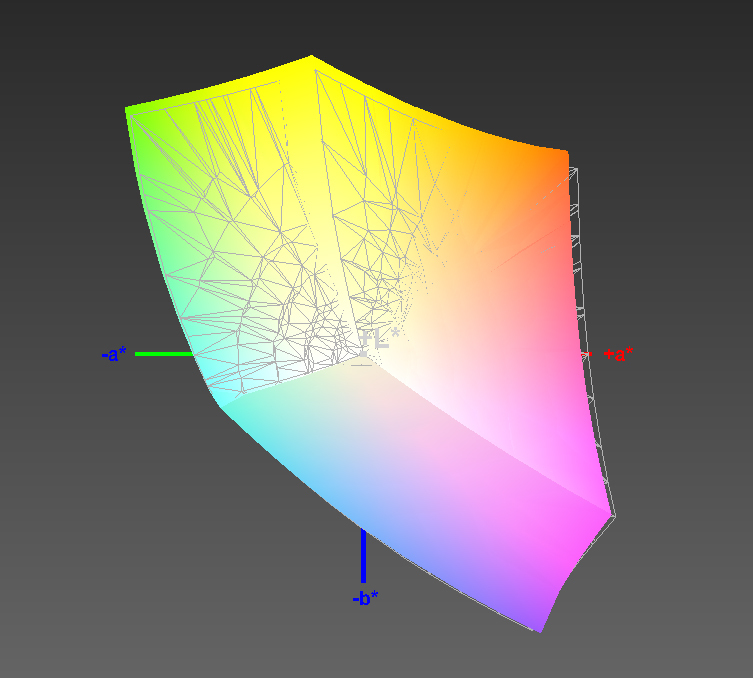 Colors look more vivid and brighter on the screen. Furthermore, a dark-grayish cast over black areas is now barely visible. We examined the color reproduction more closely with the CalMAN software and a spectral photometer. A subtle bluish cast in the colors is visible to the naked eye on the test pictures. In fact, most color rates have a slight shift toward blue. Yellow and orange display the highest deviation from the sRGB color space reference value. Blue colors are reproduced most accurately. It is primarily the light gray gradients or pure white that deviate too much from the ideal rate in the grayscale. Generally, the color reproduction is considerably more accurate and better than in the Latitude E5540, and clearly outclasses the color reproduction of the screens in the comparison devices. The sRGB and Adobe RGB color spaces are nevertheless not fully covered (but still very good with 97 % and 84 % sRGB/AdobeRGB coverage). Dell Latitude E5550 vs. sRGB (Correction 20.5.2015 due to a wrong sRGB-reference-profile: coverage 97%). The screen's matte surface and relatively high brightness is adequate to display the contents in the outdoors. Of course, it is not enough for use in the bright summer sun that shines directly on the screen, but working outdoors is quite possible under cloudy skies, or in the shade. Dell's Latitude E5550 offers very good viewing angles from all directions owing to the IPS technology. This is supported by the very flexible hinges that allow an opening angle of up to 180 degrees which make it easy to find the right viewing angle. Dell offers an optional screen protector that is to protect against curious glances from fellow passengers in the train or on the plane for 34 Euros (~$42). 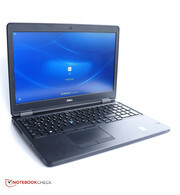 Dell's Latitude E5550 is available in various configurations. 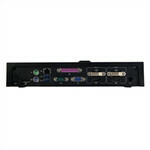 The buyer can choose an Intel Core i3-4030U, Intel Core i5-4210U or Intel Core i5-4310U processor. The latter was installed in our review sample, and takes the top position in performance. 8 GB of RAM support the processor; the less expensive devices only have 4 GB. All models have the graphics card in common. The processor-integrated Intel HD Graphics 4400 easily copes with video playback and routine office tasks. However, it is too weak for up-to-date 3D games. Intel's Core i5-4310U is a dual-core processor with a base clock of 2 GHz, and can adapt its speed dynamically according to the load. 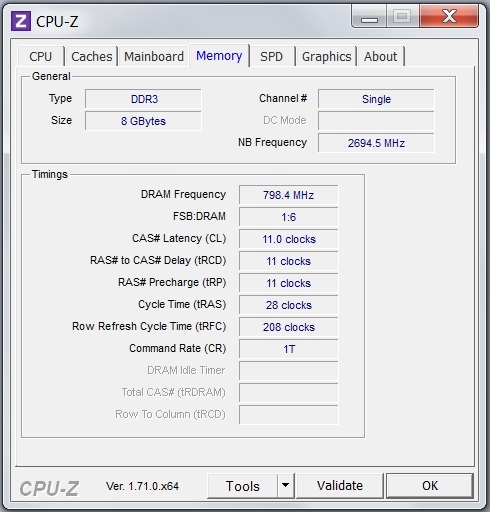 The Turbo Boost feature allows a clock of up to 3 GHz for one core or 2.7 GHz for both cores simultaneously. Therefore, it can perform slightly more sophisticated tasks, such as video encoding. It achieves a rather weak performance gain of 5% compared with the Intel Core i5-4300U in the predecessor, Latitude E5540. 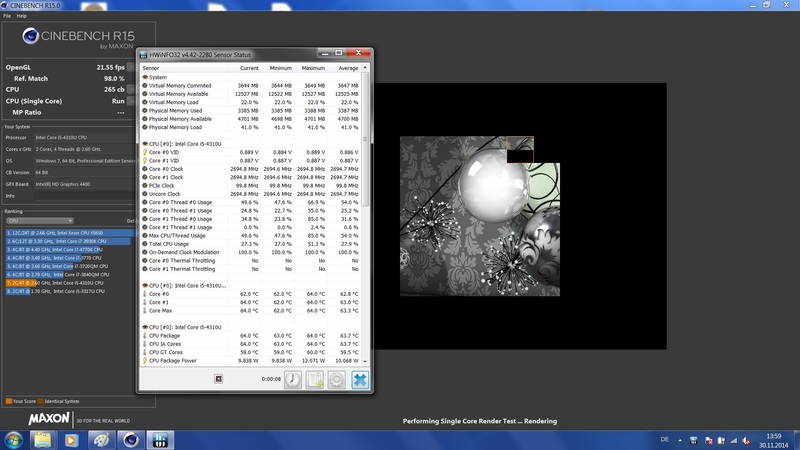 Models with a Core i3 processor or AMD APUs, like Asus' Pro P56CB or HP's ProBook 655, clearly lag behind. Fairly similar results are seen in system performance. Our configuration of Dell's Latitude E5550 is one of the fastest systems among the comparison devices. 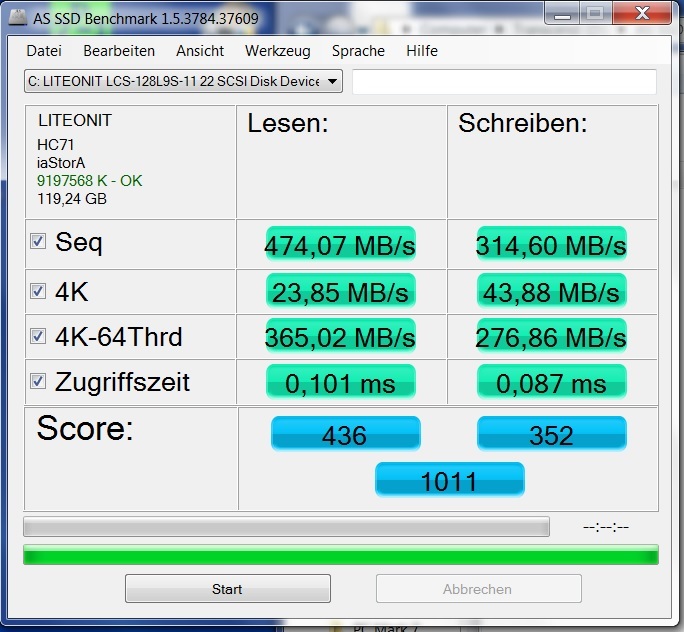 This is due to the combination of a fast processor and a speedy SSD. Furthermore, the working memory has twice the size of most laptops in the comparison. Lite-On supplies the SSD that operates significantly faster than the conventional HDDs in the comparison devices. The average data rate is 337 MB per second. Those who opt for the SSD, will however have to accept the somewhat limited storage capacity of 128 GB gross or 110 GB net. This should be easier to tolerate in an office machine than, for example, in a multimedia laptop. 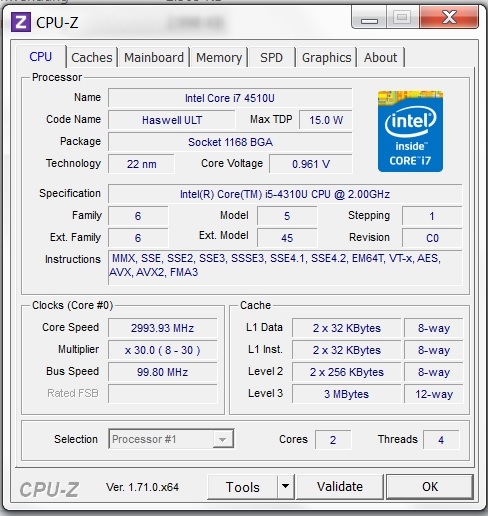 Intel's HD Graphics 4400 clocks with a maximum of 1.1 GHz, and has a base speed of 598 MHz. 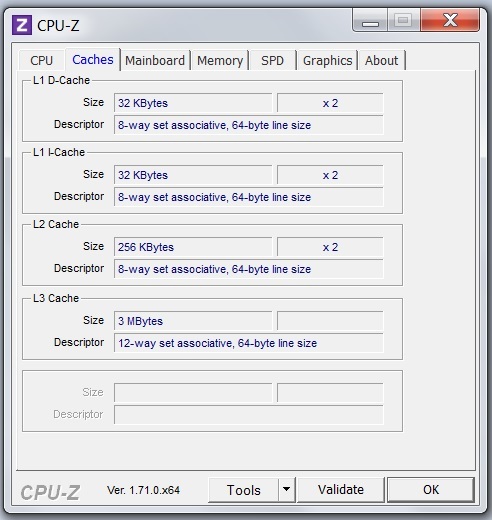 It is integrated in the processor and does not have its own texture memory, but uses a part of the working memory. In terms of graphic performance, the Latitude E5550 is not at the forefront. Asus' Pro P56CB, for example, has a dedicated GeForce GT 740M that calculates considerably faster. However, the HD Graphics 4400 is perfect when the laptop is only to be used in the office, and an occasional video night at home. Intel's HD Graphics 4400 is not made for games. Current 3D tracks do not run smoothly even in minimum settings and extremely reduced resolution. Experience shows that the graphics card already has a hard time with games from a few years ago or slightly less demanding games like Diablo III. Users would have to reach far back in their games library to find playable games. Browser games might also be an alternative. We had perceived the fan noise of Dell's Latitude E5540 as quite pleasant, and Dell has improved this even more in its Latitude E 5550. The fan is disabled completely in idle mode, and rarely started up. 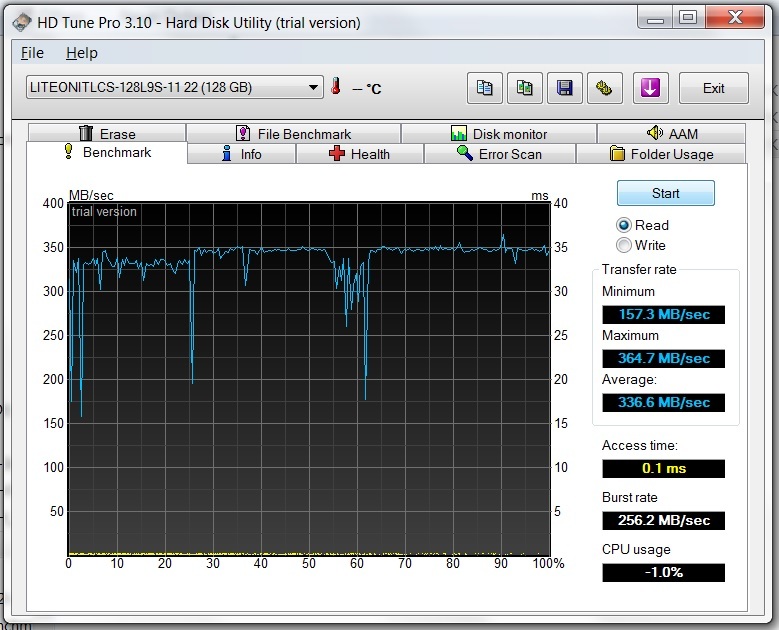 Since our review sample is equipped with a 128 GB SSD, there is no hard drive noise either. The fan is active during load, but is still relatively quiet with 32.9 dB(A). It reaches up to 37 dB(A) during absolute full load, which is still a lower noise level than from its precursor, and thanks to its pleasant frequency, in not distracting in any way - very well done, Dell! The idle temperature development is very low. The device reached a maximum of 26.4 degrees Celsius (~79.5 °F), which is hardly noticeable. The casing heated up more during the stress test, but only in the direct vicinity of the processor. Up to 42.6 degrees Celsius (~109 °F) were achieved on the underside in that area, which is felt clearly but is not yet critical. The temperatures of the wrist rest, and the left upper side, as well as the corresponding areas on the underside hardly increased, even under load. In general, the load temperatures are localized, but then also considerably higher than in Dell's Latitude E5540. On the other hand, the idle temperatures are hardly noticeable. In the main, we find the temperature management better than in the precursor since the maximum temperatures do not reach critical ranges. 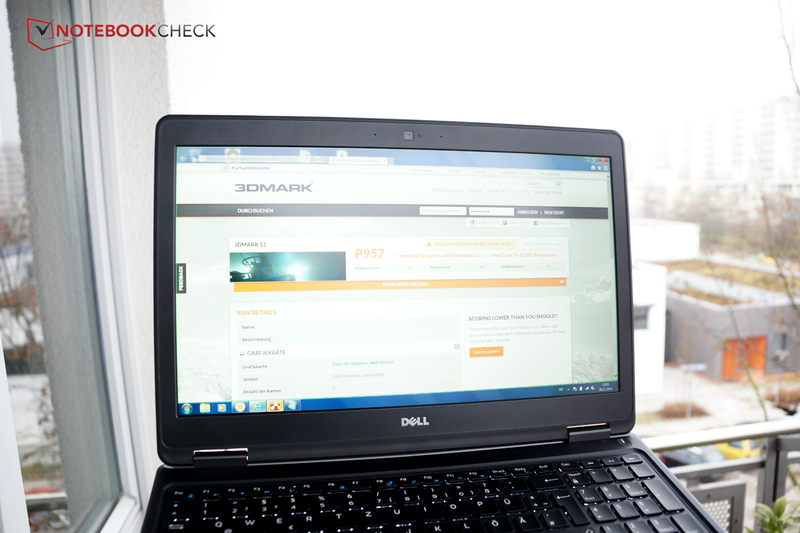 We operate the laptop under full load for prolonged periods during the stress test by running FurMark and Prime95 simultaneously. Even after a long time, the temperatures of the processor and the graphics card did not get too high. 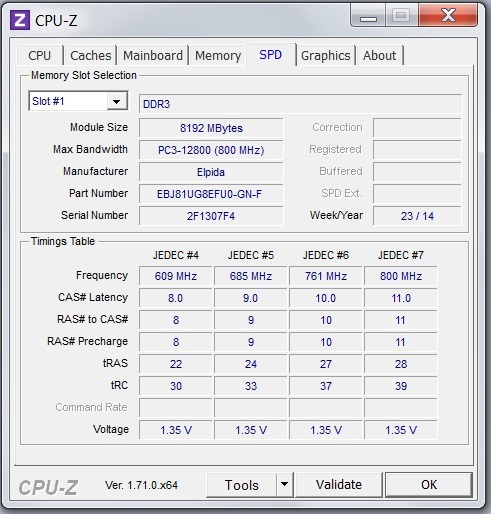 However, the processor's clock rate quickly dropped to approximately 1.4 GHz and remained at that level. 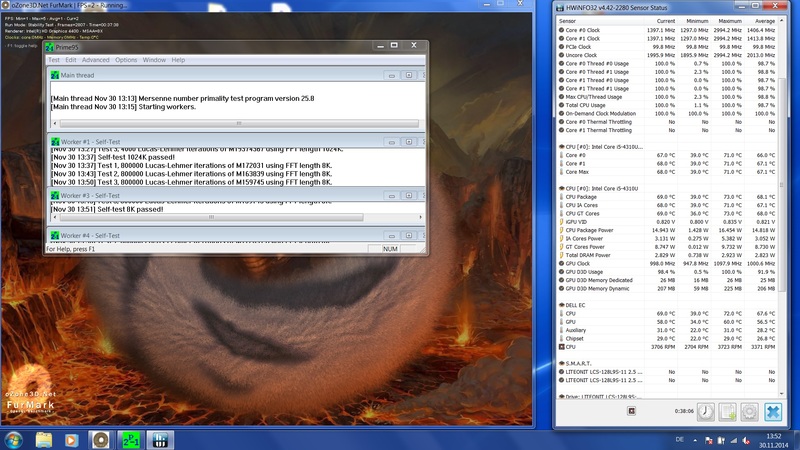 The graphics card, however, almost exhausted its full Turbo clock, and clocked with almost 1 GHz (maximum clock: 1.1 GHz). 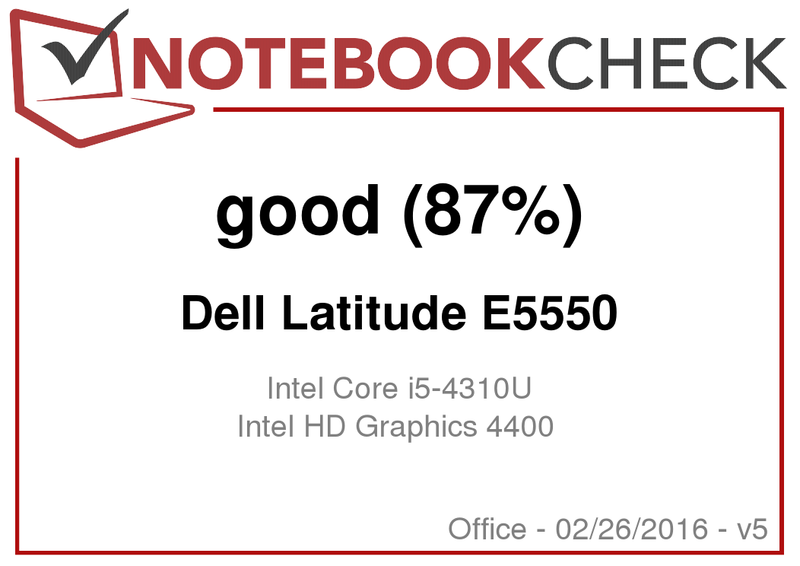 Dell's Latitude E5550 immediately reached its full performance when the stress test was stopped. Cinebench R15 performed right after the stress test, achieved the same scores as after an idle phase. Consequently, throttling should not be expected during normal load. Simultaneous processor and graphics card load is a rather unlikely scenario, especially for an office laptop. (+) The average temperature for the upper side under maximal load is 28.1 °C / 83 F, compared to the average of 29.4 °C / 85 F for the devices in the class Office. (+) The average temperature of the palmrest area of similar devices was 28.2 °C / 82.8 F (+3.4 °C / 6.2 F). We were quite satisfied with the speakers in the precursor, Latitude E5540. The sound was balanced and the speakers were quite suitable for rendering sound in presentations or videos. Therefore, there basically was not much need to improve this in the successor. Users who are not demanding music fans, and do not expect rich basses, should still be satisfied with the speakers. Single instruments can still be discerned even at maximum volume, and sometimes there is also a bit of bass. Overall, the speakers sound strong and balanced. They rarely seem overburdened, even in maximum volume and thus stand out in the field of business devices where the primary purpose is not rendering multimedia content. The Latitude E5550 consumes a much too high 3.7 Watts in standby. That takes its toll on the battery, and thus the laptop should always be shut down completely when possible. The minimum and maximum idle consumption have also increased considerably compared to the predecessor, but the load consumption has decreased to a maximum of 37 Watts. It can be assumed that an office laptop will mainly be put under very low load since undemanding programs, such as office suites or the browser, will usually be running. This load should lead to a slightly higher maximum idle consumption rates. All comparison devices have lower rates than the Latitude E5550. The battery tests will show what impact that has on battery life. Compared with its precursor, the battery capacity is considerably lower. The battery in the Latitude E5550 supplies 51 Wh; the one in the Latitude E5540 provided 65 Wh. This results in considerable runtime differences in conjunction with the altered power consumption. The differences are most obvious in idle mode. The Latitude E5550 lasted for 8:43 hours without load, unlike its precursor, that managed almost 11 hours. The E5550 was also drained much faster than the Latitude E5540 under full load. The battery life of both Latitude generations differs by one hour in the practical Wi-Fi test. The present Latitude E5550 lasted for just over 6 hours, and its precursor roughly managed an hour more. When the results are put into proportion with the other comparison devices, it becomes clear that the Latitude E5550 still lasts longer than many other devices. However, it does not achieve the outstanding runtimes of its precursor. 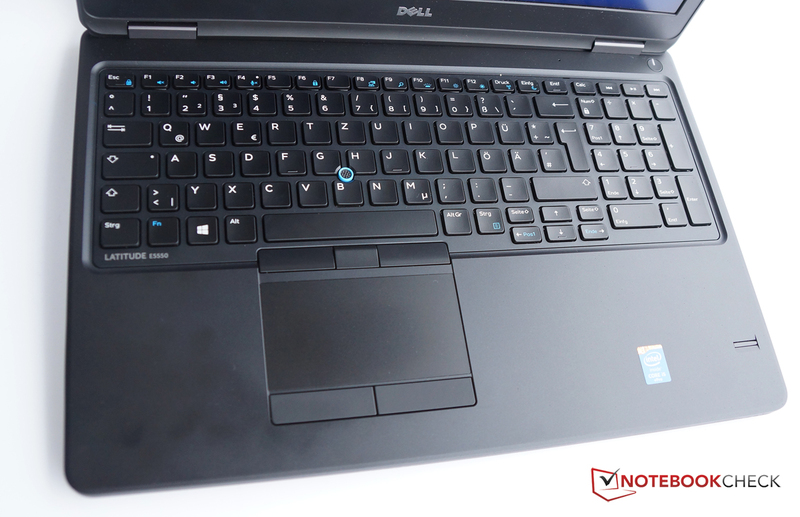 In review: Dell Latitude E5550. Review sample courtesy of Dell Germany. Dell has persistently tackled all the little points of criticism we had about the Latitude E5540, and has eliminated them without sacrificing the qualities of the precursor. At the same time, it takes a step into the future: hardly anyone uses optical drives in the era of digital distribution. Without that, it is possible to considerably slim down the casing of a laptop. This is the case in the Latitude E5550 and lets it look significantly more elegant and modern than its precursor. The casing is now also more robust, the screen is more color accurate, brighter, and is finally equipped with an IPS screen. The touchpad is larger; the keyboard has been cleaned up and provides a very pleasant typing feel. The very low operating noise and the localized temperature increases also contribute to the positive impression. Not only businesses can take delight in Dell's Latitude E5550. Private consumers who want an appropriate laptop for their home office should look at Dell's business machine. They will find a slim, relatively lightweight and non-slip casing, and the speakers with their rich sound even allows using the device for multimedia tasks away from the desk. Hobbyists will also be pleased about the easy access to all components. Only gamers will have to look elsewhere, due to the lack of a dedicated graphics card. Overall, it is a good update, and we can hardly find anything to criticize. Okay, the customer does not get a metal chassis, two audio jacks would have been nice, and the battery can no longer be removed from the outside. The battery life is shorter than that of its precursor, but still better than the other devices in our comparison. However, these are not really major points of criticism, and thus we say "definitely worth looking at" to everyone looking for a reliable companion for the office. Dell reports back with a mid-range model for businesses. Dell's Latitude E5550 is available for under 1000 Euros, but wants to be high-quality anyway. We had a few points of criticism in the Latitude E5540 precursor. For example, the casing. But Dell has completely eliminated them in the successor. The chassis is now slimmer, stiffer, and lighter. Besides that, the laptop's innards are easy to access. Unfortunately, screws have to be removed to replace the battery. Inserting the SIM card is also rather awkward. 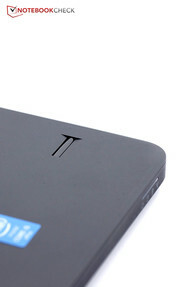 A new design has also been used, for example the power button. The keyboard has also been revamped. It is now more stylish, more stable and provides a great typing feel. The TN LED screen has also been axed. The new screen has a significantly higher viewing angle stability and higher color accuracy. The webcam is sufficient for videoconferencing, and should not be used for more. The touchpad is now much larger. The keyboard has moved upward for that. Then again, that made it necessary to omit the dedicated volume control buttons. The number pad with its own calculator button is still available. The fingerprint reader is part of the security features. Besides that, Dell offers software for encrypting and data protection. A SmartCard reader with contact-less functionality is also installed. We also liked the fact that the fan was usually completely inactive. However, the speakers are louder and even sound quite good. Dell's Latitude E5550 is basically a gigantic step forward and a great laptop for the office. The obvious improvements in keyboard, screen, and casing compared with the precursor. Some might miss the optical drive, but we didn't actually. That Dell has managed to consistently improve many annoying small issues within a short time.